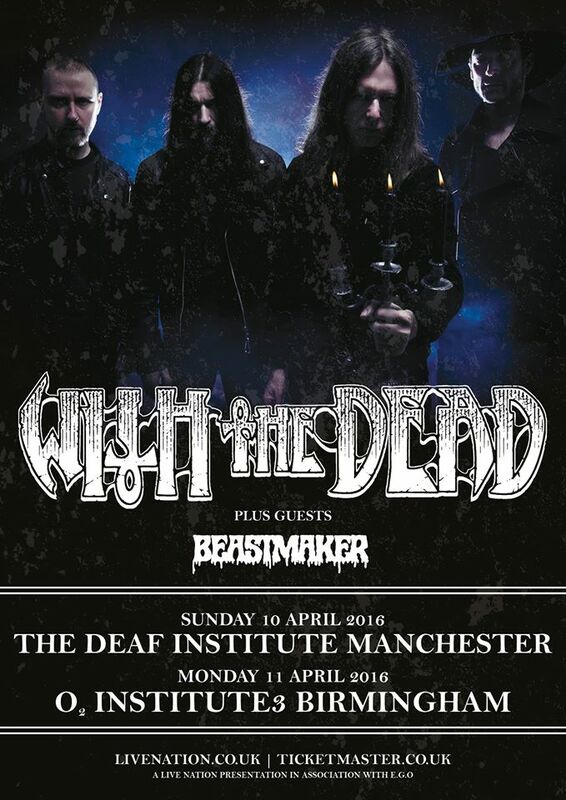 With reverberations of With The Dead’s cacophonous debut album still shaking the United Kingdom, Lee Dorrian and company marked their first ever appearance on a sedate Sunday evening in Manchester. There was a tranquil feel to the evening, outside cars rolled down the city’s usually frantic Oxford Road seemingly slower than usual, everything was calm and quiet. 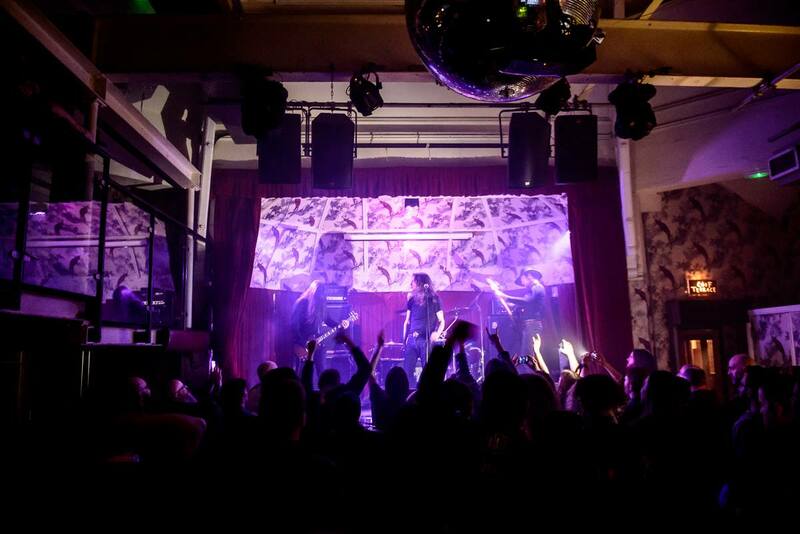 Inside The Deaf Institute meanwhile, as the birds that characterise the unique wallpaper that backs the stage watch on – yes, wallpaper at a live music venue – with a flick of a switch and a bolt of lightning, this beast became alive and primal. They punctured the room with an enshrouding darkness born from guitarist Tim Bagsahw’s simply massive tone. Forget about the whale that swallowed Jonah, that rapturous sound could swallow the whale. Joining them for this illustrious occasion, warming up the anxious and eager crowd ahead of the grand unveiling were Californians Beastmaker. Underpinned by chunky grooves that swing and snake like Black Sabbath at an occult sacrifice, the band, in a short space of time, backed the ever-rising hype that surrounds them with a status affirming performance. 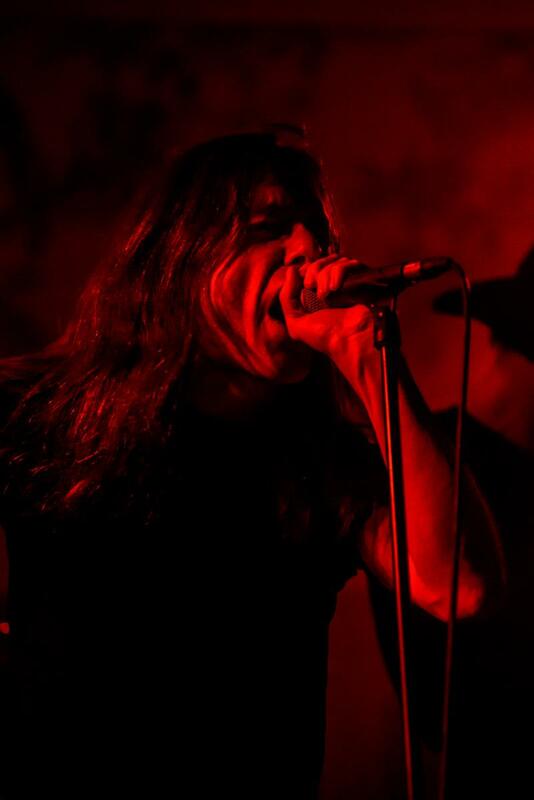 Bright young things they are, dark, infectious and venomous their sound conflictingly is. 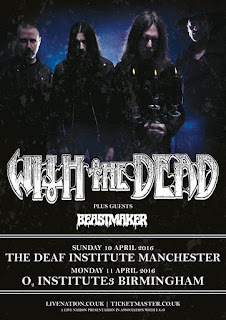 What was strange, but pleasing in equal measure, was how understated With The Dead’s maiden gig was. Absent was the need to ram themselves down your throats or put the egos on a pedestal above the audience. Instead, they kept their heads down and let their droning, apocalyptic lurch lead the foray. ‘I Am Virus’ was populated with the most evil phaser guitar setting I’ve ever heard, bewitching that already impenetrable tone yet more, while Dorrian’s Ozzy Osbourne like demeanour barked through the song’s viscous lyrics. The set as a whole though, was extremely raw. Indeed, that phaser was the only effect utilised throughout the evening, which gave their sound a distinctive primal edge. In a smoky room with blood red lights soaking the walls, songs like ‘The Cross’, full of angst, dread and despair, unveiled their emphatically miserably macabre. 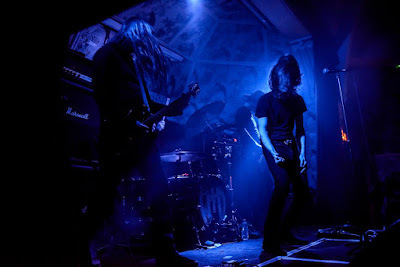 Bagshaw’s Iommi inspired riffs voyaged beyond the normal realms, expanding further and gaining a puppeteer like control over the room as he did. 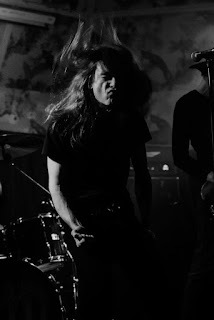 But before you knew it Dorrian walked off the stage, shortly followed by his bandmates – Bagshaw and new members Leo Smee (bass) and Alex Thomas (drums) – leaving only feedback in their wake. Out there for only an hour, they played what they had to and left. Short and sour, it was all that were needed. No gimmicks, no holds barred, it was simple and it was savage.